The result: a quarter-mile run in 9.453 seconds at 145.38 miles per hour. The mad-about-Chrysler moderators at LXForums.com say it's the fastest run done on any LX/LC platform. Follow the jump for video evidence of the blitz and for SpeedFactory's press release on the feat. Atlanta, GA, January 27, 2010 - On January 23, 2010, SpeedFactory's 426 Charger completed the quarter mile in 9.453 seconds with a trap speed of 145.38 mph at South Georgia Motorsports Park in Valdosta, Georgia. According to records kept by the LXForums.com moderators, SpeedFactory bested all previous quarter mile times set by actual production LX/LC-platform cars-modern Dodge Chargers, Challengers, Magnums and Chrysler 300Cs. SpeedFactory driver Eddie Rosa piloted the Charger. SpeedFactory, in collaboration with partners Landmark Dodge Chrysler Jeep, Vortech Superchargers and Paramount Performance, built this car from a 2006 Dodge Charger platform utilizing a unique combination of heavily modified stock components. The SpeedFactory R&D (Research and Development) Charger is a test platform for high horsepower technology destined to power SpeedFactory's production vehicles. 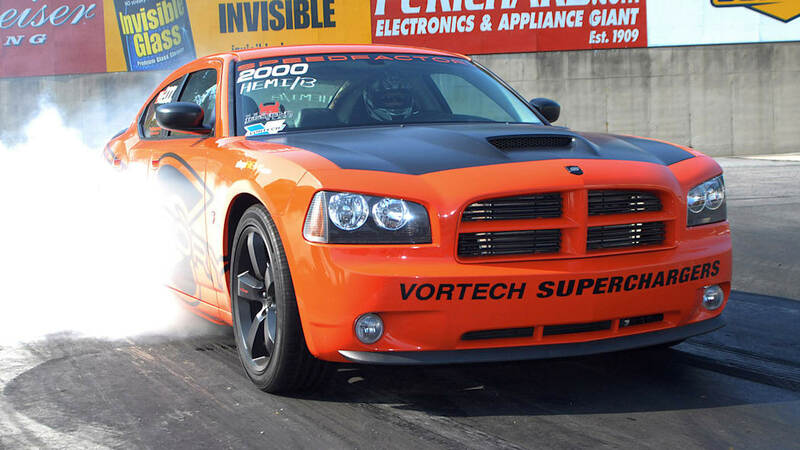 A GEN III 426 HEMI stroker motor is boosted by a Vortech centrifugal-style V-7 YSi-trim supercharger and is controlled through factory electronics, producing over 900 HP. The car retains modified factory components: transmission, IRS differential with 1000HP half shafts, suspension and shocks. A curb weight of 3,750 pounds was achieved by removing the interior. "We are all very proud of this achievement, which showcases our continued commitment to the development of our brand and ultimately carries over into our customers' vehicles," said Mark Brucks, general manager, SpeedFactory. "With the introduction of the Drag Pack Challengers, we knew that records would be broken, and to achieve this with a modified stock vehicle that still utilizes the factory components makes this even more exciting to us and our partners. We believe there is more that can be done to produce even faster times." "The Vortech V-7 YSi-trim supercharger supports up to 1200HP with 78 percent efficiency," said Gil Cormaci, director, sales and marketing for Vortech Engineering. "We are very pleased to be associated with SpeedFactory and Landmark Dodge Chrysler Jeep. The application of our YSi-trim compressor to this HEMI Charger was done with the highest expertise, resulting in this impressive time and speed." Based in Atlanta, GA, Speedfactory is a specialty vehicle company focused on unleashing the performance potential of modern Dodge/Chrysler muscle cars. 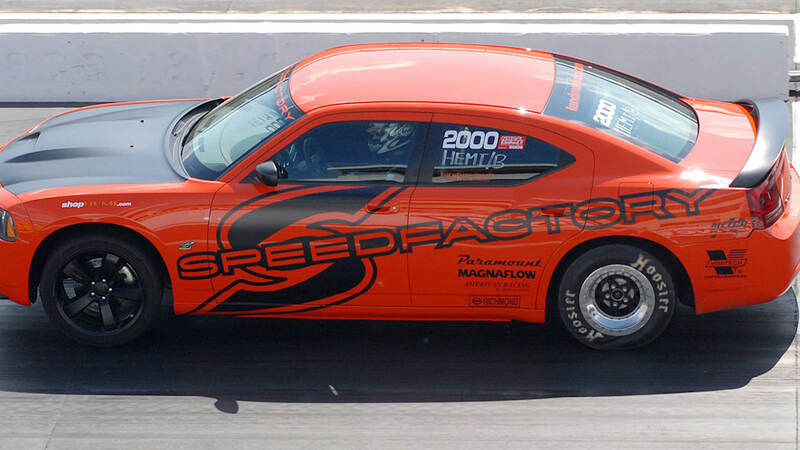 Speedfactory builds enhanced, high-energy modern muscle cars such as Dodge Challengers, Chargers, and Chrysler 300's. Speedfactory offers supercharged and naturally aspirated performance packages with limited powertrain warranties on certain vehicles and configurations. Through select Dodge/Chrysler dealers, Speedfactory sells complete turnkey vehicles and parts and enhances existing cars as well. To learn more, visit: www.SpeedFactoryCars.com.